Sometimes two stories become one. Such is the case with this beer. First, Crooked Letter Brewing Company opened its Ocean Springs, Mississippi brewery in October 2012. But it began three years before that, when longtime friends Paul Blacksmith and now-head brewer John Myers, along with Paul’s wife, Wanda, began planning the brewery and its line of four beers brewed on a 15-barrel system. Along the way, Mississippi changed an outdated law that did not allow the sale of beer with an Alcohol by Volume of more than 6.25 percent. This allowed Crooked Letter to tweak their recipes to create more flavorful and full-bodied ales. The four core brands—Mystery Romp Porter, Gipsy IPA, Stabello Italan-style lager, and Crooked Heffy American Hefeweizen—quickly made it into distribution to bars and restaurants throughout Mississippi and into parts of Louisiana. The second story involves MGM’s Beau Rivage Casino & Resort in nearby Biloxi. When it first opened in 1999, the resort operated its own microbrewery—Coast Brewing Company— in an unusual combination of the gaming and brewing worlds. Then in August 2005, Hurricane Katrina swept into Biloxi, causing massive destruction to the casino and the community. The brewhouse was lost. Exactly a year later, after extensive reconstruction, Beau Rivage reopened, but because of the timetable, the brewery did not return. Here’s where the stories meld. Bruce Cartwright, Beau Rivage’s beverage manager, learned about the Blacksmiths’ plan to open Crooked Letter. Bruce, an old skateboarding buddy of Paul’s, approached them with an idea: Would they like to brew a beer to be sold exclusively at the resort? They brewed three different styles, figuring that the management could choose one, possibly two. Beau Rivage chose all three. The trio of brews debuted officially at a party on Feb. 12, 2014, in the resort’s Coast bar, the same location where the former brewhouse once operated behind a glass wall. The beers are Sheep Shank Kolsch Ale, Double Half Hitch Imperial IPA, and Anchor Bend Imperial Stout, the one being reviewed here. 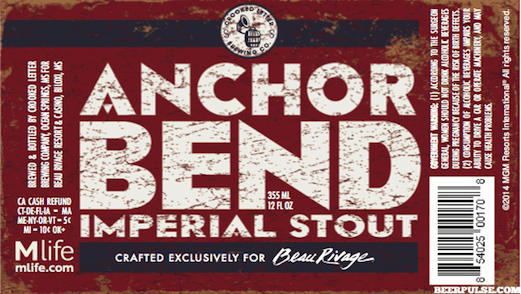 Anchor Bend pours dark out of the bottle. Really dark. So dark that you can hold it up to a lamp and the light does not shine through. The aroma reflects the darkness, but has a bit of a boozy element as well thanks to the 9.5% ABV. Surprisingly, the alcohol bite does not really come through on the palate; instead, a strong roasted flavor from the combination of dark malts predominates, with coffee and chocolate notes. It has a full mouth feel, and a mild hops bite tames most of the sweetness from the malt, giving it a dry finish. Because it’s labeled an Imperial Stout, I feel that although it’s a fine-tasting beer, it falls short in the complexity found in others in that style category. The beer has potential though. I’d love to taste it after a treatment such as aging in a bourbon barrel or on cacao nibs, cherries, peppers, or some combination thereof. Availability: Only at the Beau Rivage Resort & Casino in Biloxi, Mississippi. Bottles only, for now.